During Saturday's qualifying rounds, I could hear the crowd chanting as I walked through the grandstands even with the earplugs in my ears to dampen the sound of the screaming Formula One engines. It was hard to tell what they were saying at first, until their voices became louder and they competed with the sounds of the cars. "Che-Co! Che-co! Che-co!" Then a minute later, it was clear to everyone what these fans were saying. "CHE-CO! CHE-CO! CHE-CO!" These people were the thousands of fans who came out to the Circuit of the Americas to turn Mexican driver Sergio "Checo" Perez into the inaugural U.S. Grand Prix's unlikely local hero. Out here at the circuit, you see scores of people dressed in blue Red Bull garb because Sebastian Vettel has been so dominant in recent years. And there are an even greater number of fans wearing Ferrari red because, well, they're Ferrari — they are to open-wheel racing what the Yankees are to baseball. 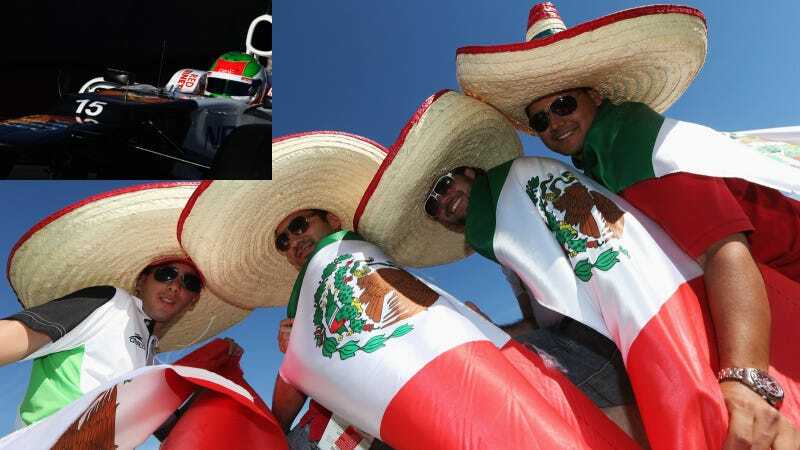 But there has also been a huge and somewhat unexpected contingent of fans dressed in white or draped in Mexican flags to cheer on Perez, the 22-year-old Sauber Ferrari driver who is one of F1's most exciting up-and-comers. In case you didn't know, Perez will be racing for McLaren next year, taking Lewis Hamilton's spot as he moves to Mercedes. Maybe Perez is not such an unlikely hero. Texas used to be Mexico until a war was fought for independence. This state has a huge population of Mexican-Americans, Mexican immigrants and Mexican nationals who call it home. And Austin is only about 235 miles from the Mexican border. Plus, Perez is the only North American currently competing in F1. For these reasons and more, the circuit has seen a tremendous turnout of people who are rooting for Perez. I've taken to calling it "Checomania," and Austin has it bad. Sergio Pérez is 22, 5-foot-8 and confident. He has dark hair, an affable smile and is only in his second year of the elite division of the motorsport. But the Sauber team member ranks 10th in overall Formula One standings and has become a Mexican sweetheart. A native of Guadalajara, Jalisco, he is seen as a positive figure for his home country, which over the past six years has been wracked by corruption and violence. You hear a lot of Mexican fans talking about Perez the way that Brazilians used to talk about Ayrton Senna. Mexico has been going through some rough times economically and socially over the last decade, but a lot of Mexicans are tired of their country only being in the news for cartel-related violence. The Mexican tourism industry has fought hard against that image. To Maria Guadalupe Cardenas, 55, Pérez's success has been a refreshing change in the headlines. But he is more than just good news, she said at the racetrack Friday. He is a role model for all young people. "He is so young and so new at this, but in such a short time, he has accomplished so much and stands out," said Cardenas, an office receptionist in Austin originally from the Mexican state of Hidalgo. Back in the stands, Miguel Candia, 52, said this was the first car race he's attended... The engineer from Guadalajara drove the 850 miles from home with a group of friends and colleagues, taking great precautions to avoid the violence, he said. Does Checo Pérez give Mexico hope? Of course, Candia said. "But so do the Mexicans who won the mathematics Olympics, the champions of the robotics competition and the winners of many cultural competitions out there. There are many brilliant Mexicans who make us proud, but today Checo is our ambassador." Unfortunately, Perez didn't qualify as well as many of his fans had hoped on Saturday. He will start today's race in 15th place after a second-round qualifying time of 1:38:206. At a press conference Satruday, Perez expressed displeasure over this situation, blaming a change in track conditions as temperatures warmed up from the morning. But he took note of all the fans in Austin who came to cheer him on. "I want to thank all the people in the grandstands and especially all the Mexicans, who sacrificed time and money to travel to Austin and bought tickets. In my country you always go with your entire family and I know this is not easy to do because it is an expensive trip. I wish I could have done better today, but I will do my very best to give all these people a good race tomorrow. For sure I will fight for points however difficult this might be." Watch out for this guy next year when he goes to McLaren. I highly doubt we've seen the last of Checomania.